If you never thought a glaring Michelle Pfeiffer would be unnerving have I got a treat for you. 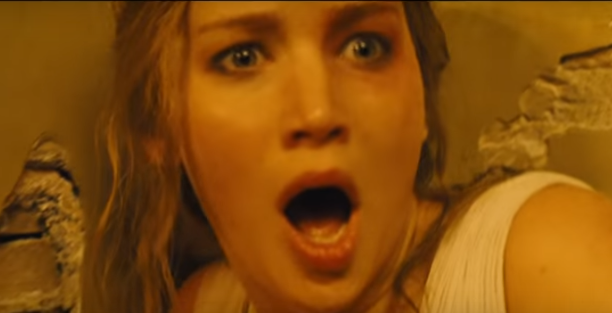 The trailer for the highly anticipated, highly mysterious Darren Aronofsky psychological thriller 'mother!' starring Jennifer Lawrence and Javier Bardem. The Paramount feature arrives in theaters on September 15 and we finally get a glimpse of the film but it's not exactly what the hell is going on. Lawrence and Bardem play a happy couple moving into a remote but charming country home only to be disturbed when uninvited guests begin knocking on their door. Strangely, Bardem welcomes them in including Ed Harris and Michelle Pfeiffer. The charm begins to wear off real quick when blood stains begin to appear out of nowhere. A montage ensues featuring Lawrence lurking around the home, seeing strange stains, getting mad dogged by Pfeiffer, shrieking occasionally, and creepy visitors approaching the home in large numbers. It's a creep-fest with very little context but there's no doubt 'mother!' is built to make you jump. Check out the trailer below and let us know what you think so far.